Click image above to view full-size. 24" x 36" size is perfect for framing. Gloss finish and protective UV coating will keep the print looking great for years. Offset printing delivers smooth lines and unmatched detail. Thanks to all the Kicks﻿tarter backers who got this project off the ground! T-shirts, laptop skins, iPhone cases, and more are also available (using a simplified version of the map) through the Stonebrown Design Society6 shop. Order details: Secure checkout provided by Pay Pal. All major credit cards accepted. Delivery via USPS Priority Mail to all US states and territories. Prints ship rolled in a protective cardboard tube. Up to 4 prints can be shipped in a single tube at no additional shipping charge. Orders ship within 5 business days, usually less. Retailers: Bulk discounts available, email for details. As seen on The Atlantic Cities, International Business Times, Southern California Public Radio, Los Angeles Magazine, LA Observed, LA Weekly, Curbed LA, BuzzFeed, GOOD, Visual.ly, Grist, and Design Taxi. Getting around Los Angeles without using the freeways would be like travelling London without taking the Underground. Sure, you could do it, but it would only show you how inexorably linked those cities are to their dominant modes of transportation. The maps of those freeways, however, haven’t gotten nearly the design attention that transit maps have enjoyed. 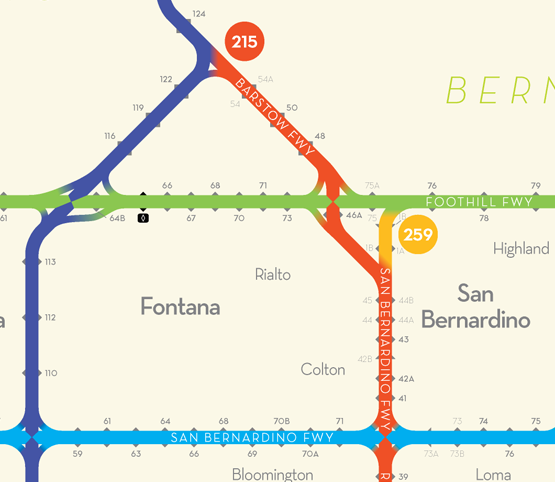 A standard metro area highway map is filled with features outside of the highways—boulevards, local streets, places of interest—that are just the sort of extraneous information that transit maps omit. 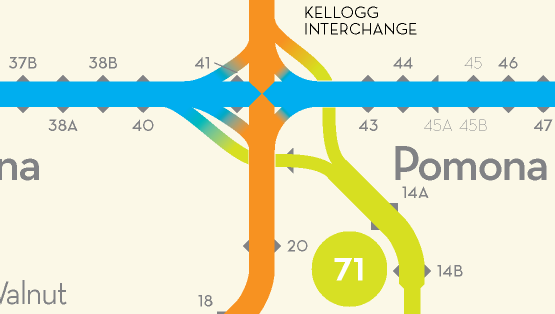 At the same time, these maps typically gloss over the details of actually using the interchanges and exits on the freeways themselves. That style of highway map is no doubt useful for many purposes. But what would happen if you designed a map that focused on the freeways as a standalone system, stripping out non-essential information to focus on navigation of the network itself? You’d get something that looks more like a transit map. 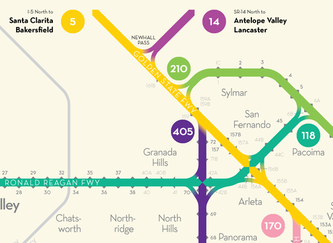 The diagram I’ve designed gives a simplified view of freeway transportation in the greater Los Angeles region by borrowing principles from transit maps. 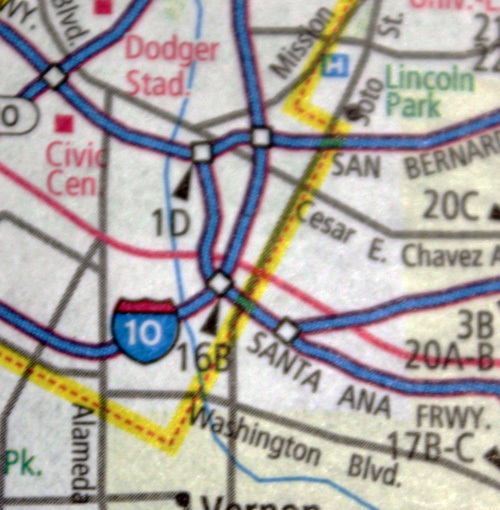 It clarifies connections among a network of 31 freeways stretching across portions of Ventura, Los Angeles, Orange, Riverside, and San Bernardino counties, an area about the size of Connecticut. 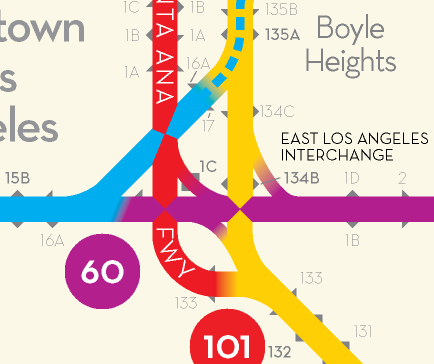 With some 75 freeway interchanges and more than 850 exits, the diagram allows Angelenos to trace a route between any of the countless pairs of entrances and exits on a single poster-sized map. The strong colors, intuitive logic, and simple aesthetic of transit maps make them powerful graphic tools. 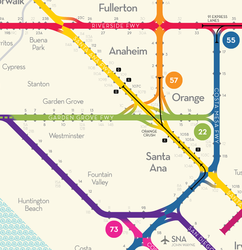 It’s no surprise then that the subway map style has been applied to freeways before, often with beautiful results. 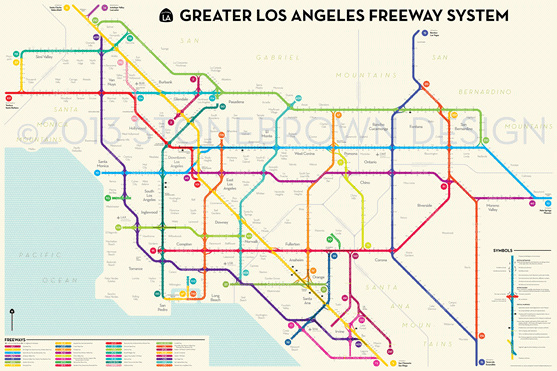 A few years ago, Cameron Booth gave us interstate highways in the style of Harry Beck’s London Underground map. His result isn’t just a pretty design, it actually illustrates the network with a directness that conventional approaches don’t quite achieve. 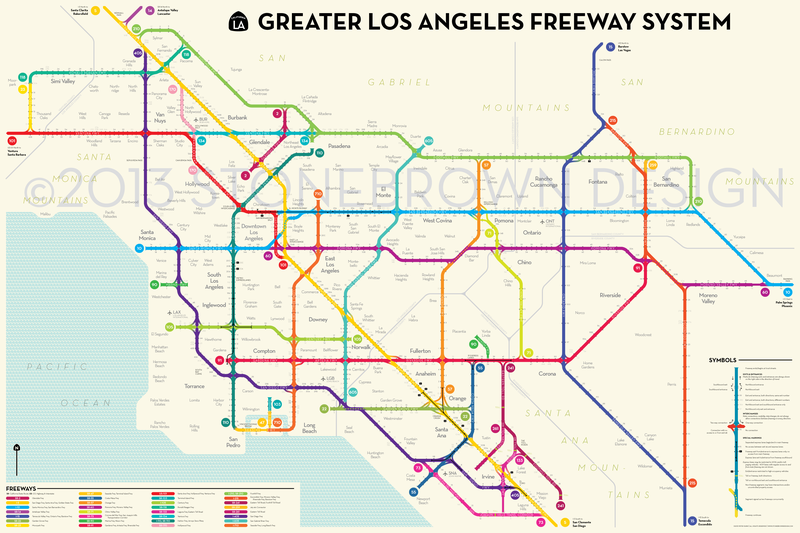 Mid-way through this project, I discovered Robert McConnell’s elegant map of Los Angeles freeways, evocative of Massimo Vignelli’s classic NYC subway map, which lets us imagine car city as a transit paradise. I love both of those (and others), but I wanted to try something a bit different. Instead mimicking the exact visual language of transit diagrams, I was interested in taking their underlying principles to see how they could be applied to a freeway system. Build on geometric rules instead of geographic accuracy, offering no more than basic directional cues. Put color to work differentiating routes. Most important, show the user as clearly as possible how to navigate the system: where to enter, which direction to travel, how to connect to a different route, and where to exit. Freeways and subways are surprisingly similar in their suitability to this approach. When you’re traveling in a tube beneath the city, it really doesn't matter to you what street you’re crossing, or just how much your path is winding to the left. The same is true on the freeway; John Steinbeck predicted that the interstate highway system would make it “possible to drive from New York to California without seeing a single thing.” Within the dense and unpredictable milieu of the city especially, freeways promise to elevate travelers out of the hubbub and into a rationalized, parallel world. In that regard, both subways and freeways are closed systems: you recognize clearly when you are on the inside or outside, and the system’s relationship to the outside world is limited by defined access points (i.e., a “limited access” freeway). Compared to the subway, though, freeways are still pretty messy, and that complexity raises new design challenges for a diagrammatic representation. For example, I don’t know of any subway station where riders can get off the train, but can’t board it. 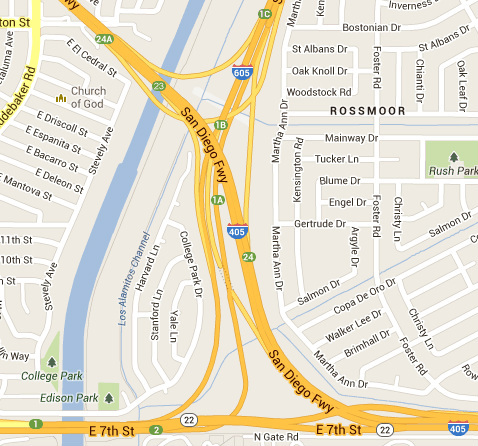 It’s quite common, though, to have a freeway off-ramp with no returning on-ramp. A freeway exit might have a different number in each direction, but Covent Garden is the name of the station no matter which way you arrive from on the Piccadilly Line. Likewise, at a transfer station where two subway lines intersect, it would be quite unusual to allow riders to connect to the Red Line eastbound but not westbound, or to allow passengers from the 6 train to connect to the Q train but restrict them from returning the same way. 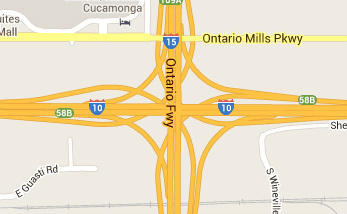 Freeway interchanges, on the other hand, are regularly made up of complicated tangles of limited connections. 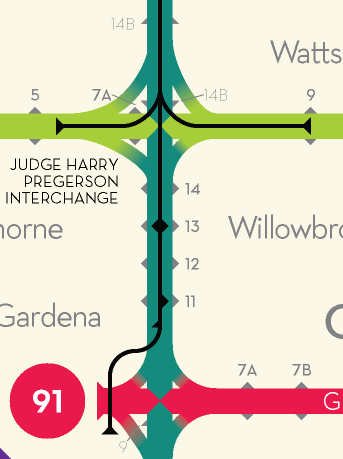 Add some exits within the interchange that are only accessible from certain directions, and the freeways’ legibility becomes much more difficult to grasp than that of the subway. Attempting to simplify those complex arrangements was a major part of my motivation in designing this map. See the design notes below for details on the solution I settled on. The result isn’t going to give you door-to-door driving directions across town, but it should do better than any comparably scaled map at getting you from on ramp to off ramp. It’s also, I hope, a more visually appealing view of Los Angeles’s most prominent transportation feature. Don’t let the aesthetics fool you, though: a freeway isn’t transit. In this transportation system, you’re required to provide your own vehicle, at your own expense, and you’ll need to maintain and fuel that vehicle regularly. A chauffeur is not included, so get some driver training, then leave that magazine or laptop in your bag and give the road your full attention. Traffic delays will be bad, or perhaps terrible--please buffer your schedule accordingly. Lastly, the hazards on the freeways are largely determined by everyone else using it, so unfortunately no one can guarantee your safety. But none of that’s to say that you don’t deserve a prettier map! How did this all come together? Read on to learn about the design details big and small that make up this complex project. Each exit marker has to show the possibility of four different paths: an entrance and an exit in each of two directions. 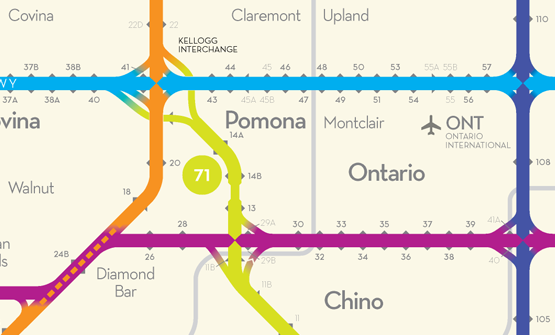 A diamond shape does the trick—its four sides represent these four paths, reflecting the shape a standard freeway exit makes on a map. The diamond is easily adjusted to show when there’s no entrance or exit. Exits and entrances are always shown on the right side in the direction of travel. Online maps usually show detail if you zoom in enough, but a road atlas, like this one from Rand McNally, isn't going to tell you what's happening at every junction. The simple symbol variations in the diagram can quickly convey more information, without adding the clutter you'd see in a map of every cloverleaf. Unlike on a subway, travelers don’t need to actually stop at every exit point. Rather than put the symbol on top of the line, I keep the exit markers behind the line to show the continuity of travel. Showing how freeways connect with each other is the most complex task of depicting a freeway system, so that’s where the diagram approach makes the biggest improvement in legibility. This was also by far the most taxing part of this project. 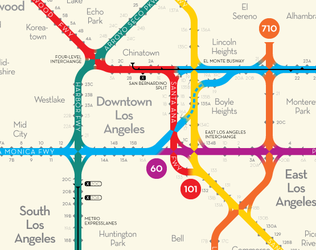 It took many, many hours to untangle the Gordian knots that are L.A.’s massive interchanges. I used whatever maps, road databases, and aerial images I could find to try to follow the paths of so many overlapping ramps, and got more than a few headaches in the process. 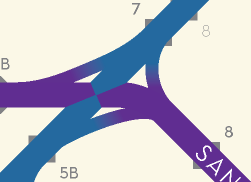 A standard interchange has to show connections in eight possible directions: traffic comes in from four directions, each of which can connect to two new directions (or continue straight on the same freeway). I use four curves to connect the freeways, with a gradient transitioning between colors. Like the freeways themselves, the connections are bi-directional, unless otherwise noted. But the diagram can clearly show the missing link. Similarly, there are a few instances when a connection can be made in only one direction. Can you see it? The diagram’s interchange makes this obvious with an arrow. It also adapts nicely to a more complex layout. Where things start to get really complicated is when you have exits within the interchange, which is fairly common. 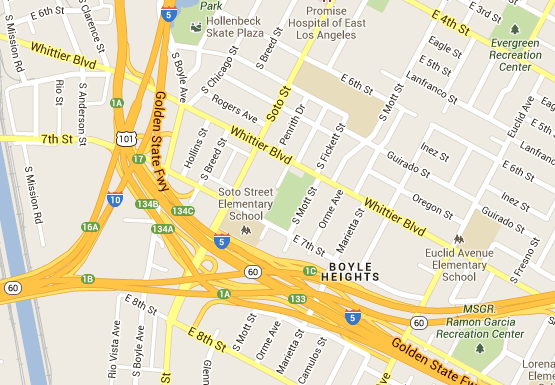 Take a look at this one just outside of LAX: Say you want exit 2A on the 105, can you get there from the 405? If you want to decipher some of the more complicated interchanges, you’ll need plenty of patience and a bottle of Advil. Just as subway maps can use more space for the most complex areas and shrink the simple parts, this design gives those interchange ramps some breathing room and shrinks the straightforward segments in between. The diagram shows connections clearly at a scale that’s visible when viewing the entire map of the regional system; there’s no need to zoom in or view a special inset. Besides its flexibility, this interchange design offers an aesthetic appropriate to the task. The color gradations mimic the transition between freeways—speeding along a ramp, it’s hard to say when exactly you’ve switched from one freeway to another. Drivers don’t connect the way a transferring subway passenger needs to step off of one train and board another; they can just shift lanes and follow the road. The smooth curves through the interchanges are meant to show that continual movement. In theory, a driver can glide through the entire system without ever stopping. In practice, your only hope of that ever happening is maybe around 4:00am. Identifying how exactly each of these lanes work was surprisingly difficult. 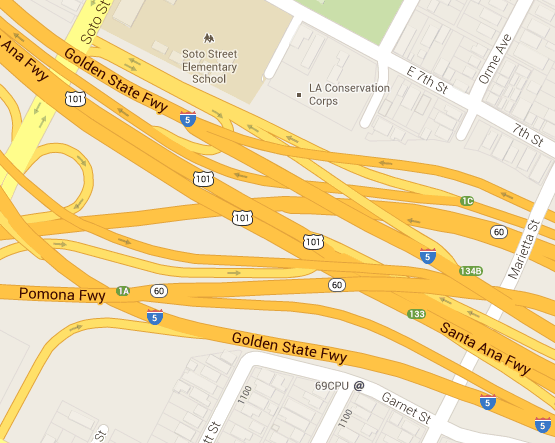 Maps often don’t identify them at all, or they don’t make any clear differentiation from the main freeway. It seems like drivers might be interested in knowing where the lane is going to take them, and which exits they can and can’t get to, but apparently the only way to find out is to go there, read the signs, and drive it yourself. (Metro has a confusing map attempting to show this that doesn't quite do the trick.) Google’s Street View helped me to figure these out without getting in the car, and the results are now shown clearly on a map for perhaps the first time. The express lanes use the same triangle/diamond convention from the exit markers to show where drivers can enter or exit the express lanes from the main freeway. Note that there are many, many more miles of HOV and HOT (toll) lanes on these freeways. Even though they sometimes function as express lanes, I chose not to show those that have regular access to and from the main freeway. For example, the 105 has HOV lanes, but exits and entrances to the lanes are so frequent that they’re not substantially separate from the main freeway. They aren’t on the map. Once you take the ramp from the 105 HOV lanes to the 110 express lanes, however, it’s important to know that you can only travel to 110 northbound, not southbound, and that you’re then going to be stuck in those lanes for several exits. When the information affects route choices, it’s included in the design. 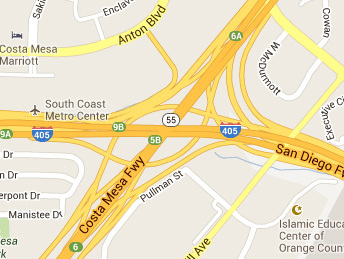 Maps often mark toll roads in a different color, but they don't tell you where exactly you'll be paying a toll. For the Orange County Toll Roads, I mark toll plazas in the main freeway and also use a different color to mark on ramps and off ramps that are tolled. It doesn't uncover any way to sneak around the tolls, but it at least shows you where your last chance to exit before paying is. For exits, numbers serve as the only labels. True, exit numbers aren’t often used as reference points for intra-city highway travel. It’s typically more effective to just name the road you need to get off at, and a highway sign will tell you which exit to take. Californians didn't even have exit numbers until relatively recently. 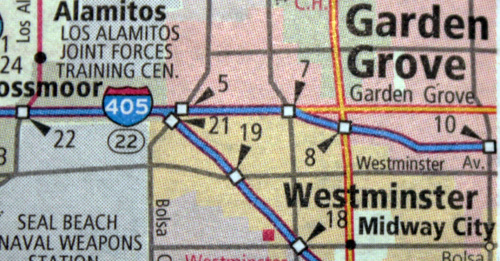 Some L.A. exits have numbers that seem to exist only on maps, not on any signs. A few still don’t have numbers at all. That said, using exit numbers instead of road names makes this diagram possible in the first place. 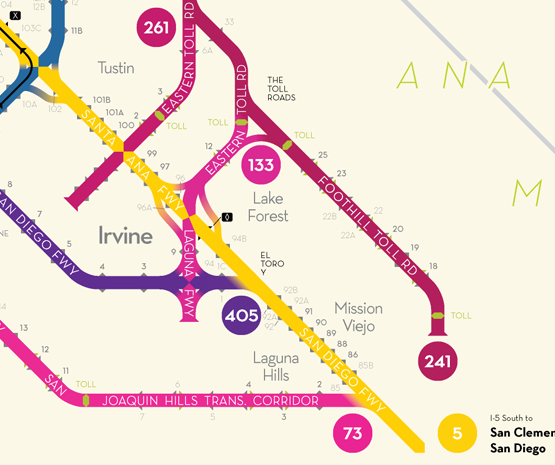 Numbers are the freeways’ logic, and this map ignores the messiness of local streets. 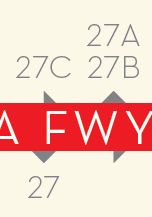 Showing road names—often more than one at a single exit—at a legible size would probably require quadrupling the size of the diagram, if it’s feasible at all. Exit numbers are plenty useful in themselves, though. They go in order, making it easier to reference your destination against your current location. As a bonus, they usually correspond to mileage. 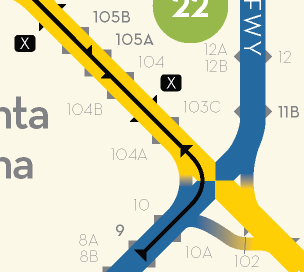 Numbers for exits in both directions are marked in bold; numbers that only apply to a single direction use a lighter weight and are marked on the corresponding side of the freeway. 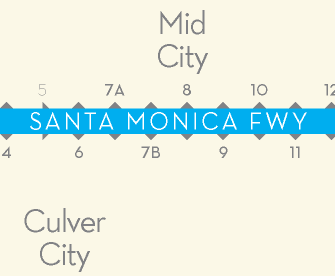 The freeways themselves get both names and numbers. In signage and in speech, Angelenos use them both. They’re also not synonymous. US-101, for example, is called the Hollywood Freeway for its stretch through Hollywood. North of Cahuenga Pass, the Hollywood Freeway continues onto SR-170, but US-101 continues as the Ventura Freeway, which is also the name for SR-134 to the east. 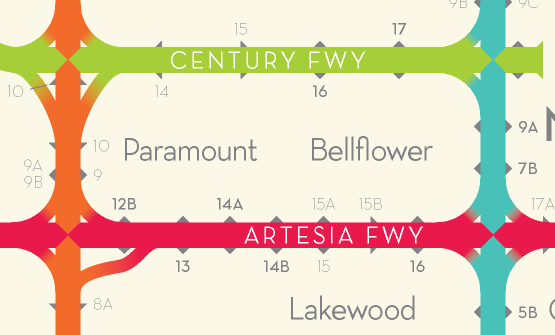 The freeway colors are based on route numbers, giving them the greatest visual prominence, but names also appear to aid in orientation. Freeway labels also ignore the type of highway—interstate, U.S. highway, or California state route—because it's not relevant to actually getting around. The highway types are noted in the table at the bottom, with the assumption that the average driver doesn't need an immediate answer to the question "Is that I-22 or SR-22?" 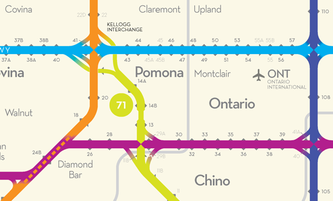 When a freeway is signed as two different routes, I considered showing them as two adjacent parallel lines, like you'd see for two services on the same subway lines. Eventually I decided that didn't make sense. On the subway, you're either on an Orange Line train or on a Blue Line train, even when they share the same tracks. 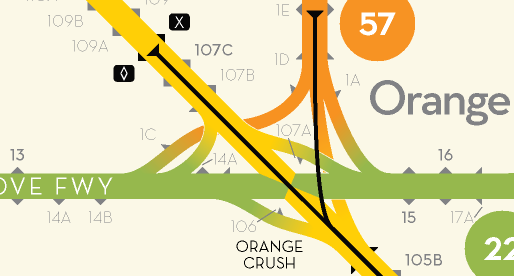 But on the freeway in Diamond Bar, you're on both the 60 and the 57 at the same time, so the diagram shows a single-width line, with a dashed line to show the concurrent route. The freeway that controls the exit numbers gets priority. 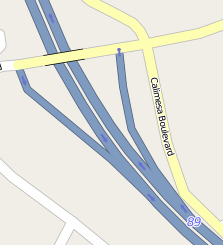 A "freeway" for this diagram is a road with no at-grade intersections and no access directly from adjacent properties. Many important highways in the region that don't fit that definition aren't included. 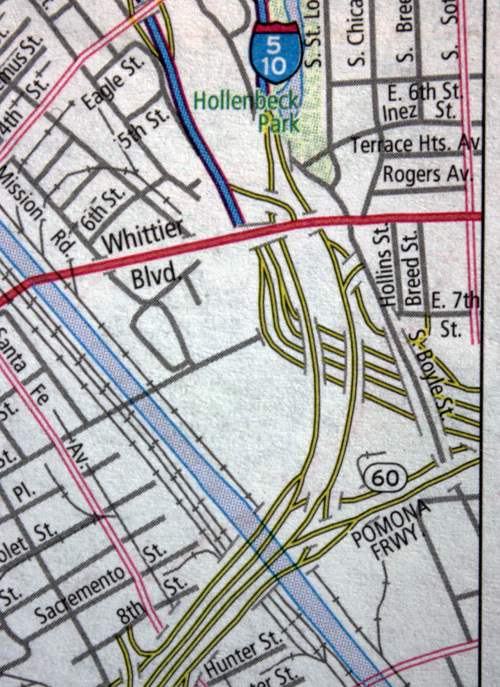 When a route goes from a freeway segment to a highway, I mark it as the terminus of the freeway, even if it isn't the terminus of the route. The only exceptions are a few brief segments that connect to freeways on both ends. Place names for cities and neighborhoods help provide some of the location cues that exit numbers can’t. They will be familiar to locals, and also appear on highway signs in much the same way that key stations do in subway directions (e.g., the 110 south to San Pedro, the 1 train downtown to South Ferry). I limit the hierarchy to two sizes, employed subjectively. 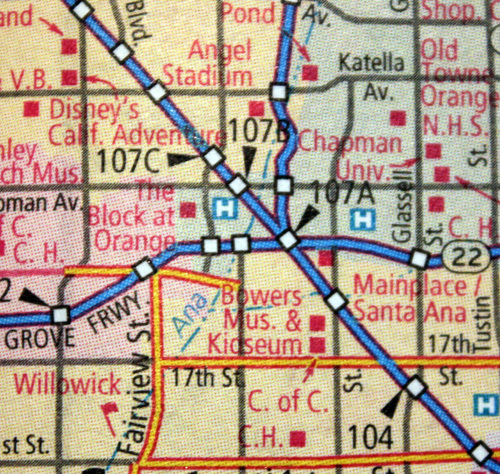 Spacing plays a role here too--Northeast Los Angeles is pretty tight between the Glendale Freeway and the Arroyo Seco Parkway, so Highland Park and other neighborhoods don't get shown. 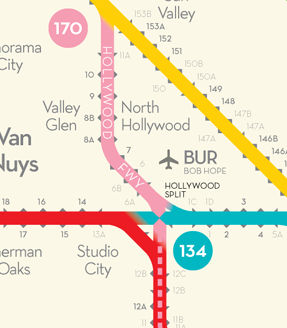 County lines are included as points of reference, and airports make the cut as well. Similarly, the ocean and the mountains aren’t just familiar geographic reference points on the map, they help you confirm which direction you’re pointing on the road. I tried a few versions using colors to trace out the actual territory of the region’s mountains and hills, but found it too heavy. I scaled back to text labels for the major ranges. A simplified coastline helps make the diagram recognizable as Los Angeles. Neutraface, designed by Christian Schwartz of House Industries, is based on the lettering and general aesthetic of mid-century modern architect Richard Neutra, whose houses helped define the post-war style of the west coast. Since then, Neutra house numbers have become a popular marker of domestic design sophistication among the Dwell set. Now, Angelenos can enjoy Neutraface exit numbers. Why not bring a little glamour back to the highway? Many thanks to the many people who gave the map a close look and sent in their feedback in the weeks after it was first published in summer 2013. Having so many eyes on the project was a huge help, and the local knowledge of the L.A. area was indispensable in making this an accurate picture of the region. Laguna Fwy: Remove connection from 405 north to 133 north. 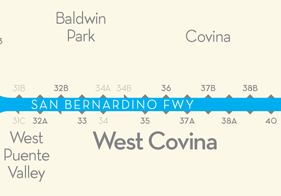 Add SR-91 label at terminus with I-215. Corrected a few mis-placed and mis-formatted exit labels; changed labeling for Moorpark exit between SR-23 and SR-118. It doesn't include street names, only exit numbers. I know that exit number are not widely used, or even used at all, but this was a design decision made early in the process. At this scale, including the names for each of the 1-4 streets accessed from each of 850 exits would turn this into a giant mess of tiny text going in all directions. 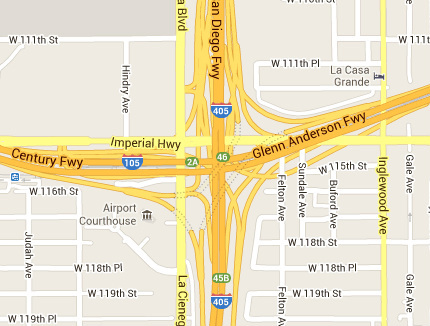 It would overwhelm the map, and I wanted this design, unlike a regular street map, to focus on the freeway system. Maybe a map of a smaller area (or a mobile app) could incorporate these names successfully. But for my purposes, the exit labels just need to show that there's a way into or out of the freeway there, and the numbers do that just fine. It doesn't include the Pacific Coast Highway. Even though it's iconic and it's an important travel corridor, it's not a freeway. It has traffic lights and cross streets and access from parking lots. I did explore how to incorporate it into the design, but it just seemed to be a distraction from the main focus on the freeway system. 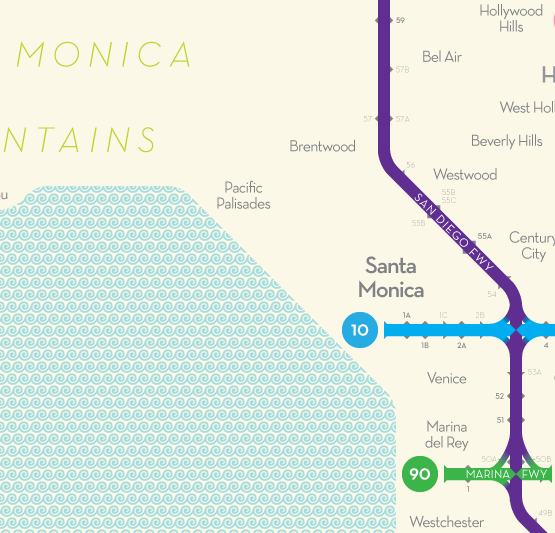 Plus, if the PCH is included, what about Santa Monica Boulevard, SR-2? 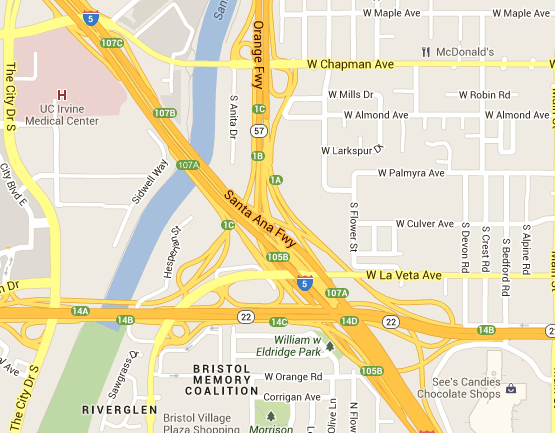 The map has the two freeway ends of SR-90, why not show the route in between? It's easier to draw the line at freeways only. Thanks again to everyone who sent in feedback. Your thoughts are greatly appreciated!